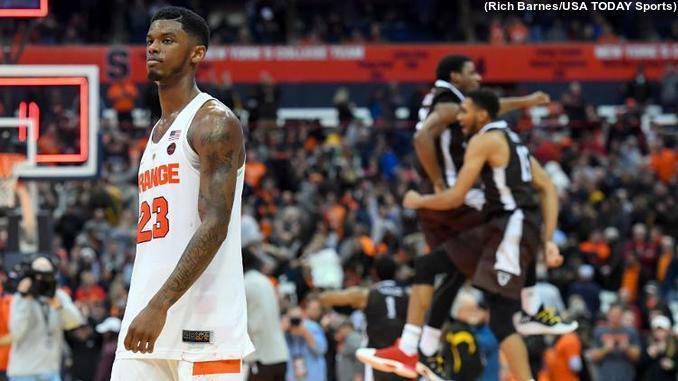 With the non-conference schedule in the books, Syracuse has to feel pretty good about where they stand. The Orange are 11-2 and Ken Pomeroy has SU rated #51 in the country and Jeff Sagarin 42nd. That win-loss record is probably a little better than what most expected for SU at this point. My preseason prediction of Syracuse finishing somewhere in the range of a .500 overall record to an NIT berth included a 9-4 mark in non-conference play. Being two games better than that nudges the Orange closer to the NCAA Tournament bubble. But will they make it back to the dance? A few things we have learned about a team that was almost all question marks coming into the season will help us figure it out. 1. The defense has been excellent almost all season long. Simple stats bear this out. The Orange have given up 70 or more points only four times this season, which includes Maryland getting exactly 70. Syracuse’s pace of play, which is 334th in the country, helps keep opponent points down. SU is also stingy, allowing opponents to make only 38.4 percent of their shots from the field (23rd nationally), including 32.9 percent from three-point range. The advanced stats provide a little more evidence. Syracuse closes their non-conference schedule ranked 43rd in defensive rating at 92.4 points per 100 possessions (pace of play is removed by this stat). In Ken Pomeroy’s ratings with defensive efficiency adjusted for opponents, the Orange look even better, ranking 22nd at 94.2 points per 100 possessions. A big part of that success comes from the team both creating steals and blocking shots. Five different SU players average at least one steal per game with Frank Howard leading the way at 2.3 swipes per game. When all those thefts get added up, the Orange force steals on 13.2 percent of all opponent possessions, which ranks 12th in the nation and third among all Power Five teams. Only West Virginia and Texas Tech force more steals among major conference teams and both have faced considerably easier slates. Led by Paschal Chukwu, Syracuse is second in the country in block rate at 20.8 percent. That means approximately one of every five two-point attempts by SU opponents gets marked “return to sender”. Chukwu is responsible for 43 of the 82 blocks recorded by the Orange, as he alone has a block rate of 17.6 percent. While it is unlikely that Chukwu will keep that rate that high all season, it would tie him for the second-highest individual block percentage in the last nine seasons. 2. The Orange, who have not been a good rebounding team for several years, are excellent on the glass. Having won the battle of the boards in every game this season, Syracuse stands 10th in the country in rebounding percentage, grabbing 57 percent of all available rebounds. The Orange have claimed 39.8 percent of all possible rebounds on the offensive end of the season, good for second in the country. Their “weakest” link is defensive rebounding and SU still claims 74.5 percent of all possible defensive rebounds. Decorum prevents me from sharing last season’s rebounding percentages for the Orange. Suffice it to say, they were not even in the same area code as this year’s squad. 3. SU is a very poor outside shooting group. No matter how you slice it, the Orange are not a good perimeter shooting team. 318th nationally in three-pointers made, 320th in three-point percentage. Tyus Battle’s hot second half against Eastern Michigan got him back above 34 percent on the season and Frank Howard’s 3-for-8 game nudged him back over 30 percent. Oshae Brissett, the only other player with a consequential number of three-point tries, is at 28 percent overall. Unsurprisingly, Battle has shot terribly in SU’s losses, going 3-for-20 on threes against Kansas and St. Bonaventure. Howard has been streaky (6-of-14 to start the season, then 5-of-30 over six games, then 8-of-18 in his last three) and Brissett has seemed to move away from the perimeter lately with just five attempts in the last three games. 4. The weak Syracuse offense has other problems than just its perimeter shooting. The Orange currently stand 155th in the country in offensive efficiency at 106.1 points per 100 possessions, but 284th in the country in true shooting percentage, which factors in three-point shooting, two-point shooting, and foul shots. Ken Pomeroy’s adjusted offensive efficiency, which factors in opponent quality, has SU at 107.6 points per 100 possessions, good for 91st in the country. Even the basic stats are not good. Syracuse is 247th in two-point field goal percentage at 48.7 percent and 42.8 from the floor as a whole, which is 275th nationally. The lack of perimeter shooting, especially when coupled with limited range from interior players, really bogs things down. A simple pick-and-roll is actually simpler for SU’s opponents than the Orange themselves. With two of the Chukwu/Matthew Moyer/Marek Dolezaj trio almost always in the game and none of them looking to shoot outside of the paint, the most basic offensive play in basketball gets nullified far too easily. Chukwu screens at the top of the key and his defender shows on Howard as Howard’s defender recovers. Moyer/Dolezaj’s defender cheats in the paint, as neither is a perimeter threat (six three point tries from each thus far), further deterring Howard from driving. That screen is set simply to see if Howard can be sprung on a drive, either for a lay-up or pass to a cutting Moyer/Dolezaj (Chukwu is not a reliable roll man). If the screen does not get Howard that clear lane, Howard backs the ball out and the offense resets with perimeter passing between Battle, Brissett, and Howard. That is just one way that the offensive limitations of the individual Syracuse players have a cumulative effect, hindering the offense as a whole. 5. The Orange make up for some of those offensive shortcomings at the free throw line. Syracuse gets to the foul line a lot, standing in the top 40 in the country in two different free throw rates. So, even though they may not make a ton of them (SU is 227th in the country at 69.1 percent from the stripe), the Orange still get to the line enough to make a difference. Throw in that Brissett, Battle, and Howard have taken 65 percent of the team’s free throws on the season and are hitting 77.9 percent collectively (Howard’s 69.2 percent mark is the lowest of the trio) and you can see how the team probably is not as bad from the stripe as their overall mark suggests. All told, the good news is that defense and rebounding have been showing up every night for the Orange and that will help keep them in every game. The bad news is the offense is spotty and the team’s slow pace helps keep opponents in the game, much like the SU teams from two and three seasons ago. Those teams were NCAA bubble teams, one of which sat out the postseason and the other got a ticket to the dance, then made a surprise run to the Final Four. It will be another season where SU struggles, but pulls out a good number of close wins (their tenacity thus far has been impressive) while also getting rolled in a couple games where the offense never clicks. Combine it all and the Orange will be in a familiar place, squarely on the NCAA Tournament bubble, scrapping for a bid.